80,000 youth ages 16-24 in the San Francisco Bay Area are disconnected from employment and education. Without connecting to school and work, these young people are at high risk to be poor, unemployed, homeless or incarcerated throughout their adult lives. All youth should have the opportunity to transition to a fulfilling, economically sustainable adulthood. New Door Ventures provides skills training, meaningful jobs, education assistance and personal support to help disconnected youth get ready for work and life. Are you 16-24 and looking for a job? Click here to learn about our program. 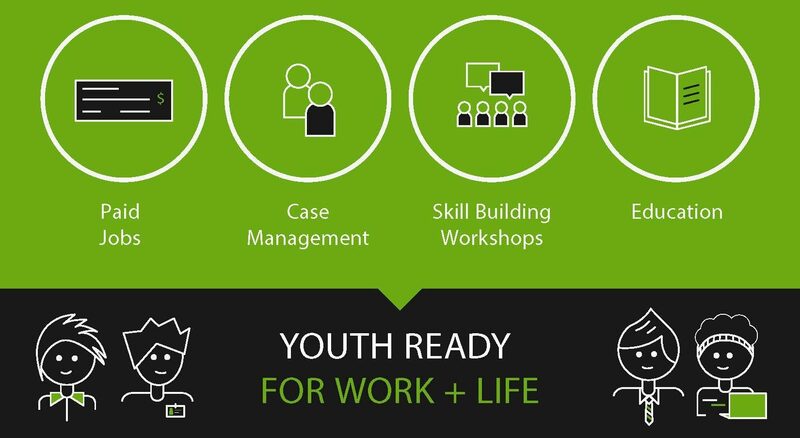 We prepare young people for work + life. 93% of graduates are in jobs or school 6 months after our Employment Program. 251 youth have been placed in employment through New Door Ventures in 2018. Youth preparing for high school equivalency (HSE) exams passed 94% of tests. We are a nonprofit, but we also run businesses. New Door Ventures owns and operates Ashbury Images, a screen-printing and promotional products company, and Pedal Revolution, a full-service bike shop. In addition to providing quality goods and services, these businesses employ youth interns to screen print shirts and tune up bikes. Pedal Revolution sells, repairs and builds the highest quality bicycles you’ll find anywhere in San Francisco. Ashbury Images provides top-notch screen printing, promotional goods, and embroidery services. Through our employment program, young people secure paid internships at our two social enterprises and at local businesses we call Ally Partners. They provide a real job, training and hands-on experience. Youth gain skills and confidence through working. New Door provides the skills training, education and individualized support to ensure youth have what they need to succeed. Access to jobs and support changes lives. Learn more on our blog. Carla came to New Door with goals, but it was the support she received that helped her achieve them. Change a young person's life. Donate now. Individuals like you provide the necessary resources for New Door to prepare youth for work and life.